Status of Batam, Bintan and Karimun as the Free Trade Zone (FTZ), re-affirmed by the decision of the Minister of Finance Regulation (PMK). This is discussed in the meeting of economy ministers of the Republic of Indonesia with entrepreneurs Batam, Bintan and Karimun on Friday 15 January 2010. The meeting was attended by 5 ministers and ministerial-level officials. These five ministers who attended the SOE Minister Mustafa Abubakar, Hatta Rajasa Economic Coordinating Minister, Marie Elka Pangestu as Trade Minister, Sri Mulyani as finance minister and chairman MS Hidayat as Minister of Industry and Gita Wiryawan as head of BKPM. One of the discussions in these meetings is on the release of taxable goods, VAT, and one decision that can be muffled fears of double the true tax season should be eliminated. This is as expressed by Gita Wiryawan as the head of BKPM. Meanwhile, Marie Elka Pangestu, asserted, to import goods rather than new metal, the authority has been submitted to the regional body. "The authority to import non-new metal has been submitted to the Supervisory Board authority area, so they are set, the center stayed to watch and make periodic evaluation" the trade minister said. 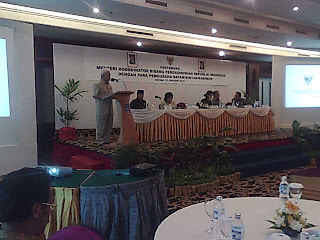 At a meeting of the Coordinating Minister for Economic Affairs of the Republic of Indonesia with the Entrepreneur of Batam, Bintan and Karimun in Batam, also attended the Riau Islands Governor Ismeth Abdullah, he said that while not perfect, but the implementation of Bintan Batam Karimun FTZ has the people's welfare. Weight ratio of workers in the FTZ Batam Bintan, Karimun 1:2,2 says that he only meant one person working only carry two people. "It's quite healthy," he said. From the investment side, the personality until now, the Government of Riau Islands Province of record 1290 foreign investors who invest in Bintan Batam Karimun FTZ, with a total investment of U.S. $ 2.5 billion. Even so, Ismeth said there obstacles in the implementation of Bintan Batam Karimun FTZ. "Bintan Batam Karimun FTZ going well, but needs refinement to improve competitiveness with other kasawan in Asia Pacific," said the Riau Islands governor. Completion is expected in the year 2009 also PP.02 Regulation of the Minister of Finance No.45, 46 and 47 in 2009. Ismeth also requested further increase the determination of free ports in Bintan Batam Karimun FTZ. Minister of Transportation, said Ismeth, set free six-port in Batam, Bintan and two in one in Karimun. "It remains to be added, by setting free port in Tanjungpinang," he said. Meanwhile, Coordinating Minister for Economy Hatta Rajasa said the government is committed to promoting Bintan Batam Karimun FTZ with the revision of the Act and PMK. "This is proven by so many Ministers are present here, an extraordinary commitment," he said. On the other hand, Sri Mulyani as finance minister said, related to upstream oil and gas exploration activities, will be governed by rules adapted in the corridor FTZ. Regulation of the Minister financial and No. 46 in 2009 also said the notices in the framework of the customs revenue and expenditure of goods from and to areas that have been designated as a FTZ area.